Click on an empty space on flavor, go to "Insert" menu on the Flavor Editor menu. We will edit source codes of onLoad event later in the following sections of this tutorial. Now continue with editing the flavor. 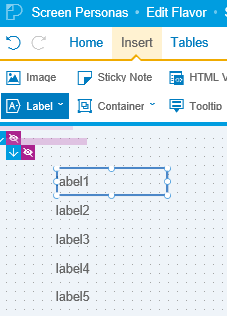 Insert a Label control on your SAP Screen Personas flavor. Highlight recently added label control and attach a script function to onClick event of the control. To do this, select label on flavor layout. On Personas editor, switch to Insert tab. Now we are ready to add new labels on our Personas flavor. Just to gain time, you can clone the label control to create a number of new labels. To clone a control, select the source control then switch to Insert tab. You will see Clone Control on the far-right part of the menu items. By cloning the label control, I have 5 labels on my sample flavor at the end. Here is the table structure I preferred to use for keeping link metadata for this SAP Screen Personas flavor. Next step for ABAP programmers is to create the RFC function module which will provide the URL list data to the UI where this information will be consumed and displayed using label controls. Please note that the RFC function name is "Z_URLLIST_CH". 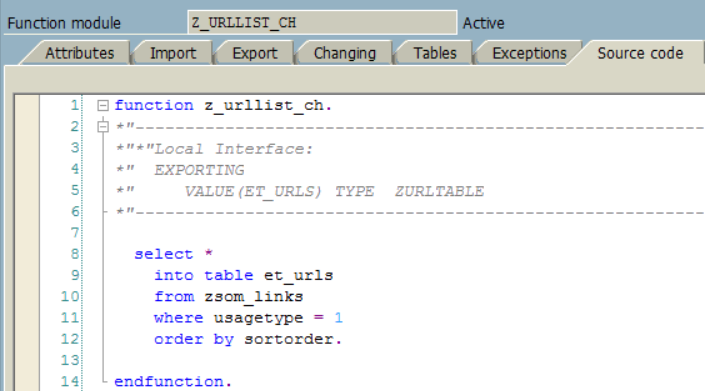 The output parameter is named "ET_URLS" which returns the same data structure as the ABAP table repository object for links data. Please add the RFC function name to the whitelist RFC list using the Personas Administrator transaction. 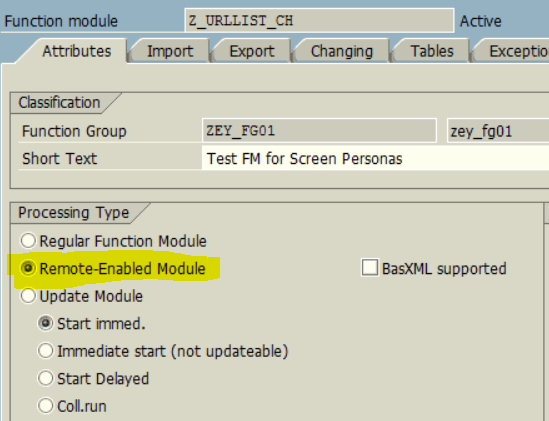 SAP Personas administrators can refer to tutorial add RFC Function Module to SAP Screen Personas FM Whilelist for details. Following code calls RFC function from backend SAP system and stores the output table parameter into a local variable. Here the problem is that, when you create your own flavor and add your own labels onto the flavor surface, you will have a different set of label ids. So please update below code, with your own values. session.utils.put method is used to create session parameters and store string values in these session parameters. The first parameter to the session.utils.put() method is the session variable name, it is string. And the second parameter is the value of the session variable which must have string data type. I keep the links which has the IDs of label controls and the data from SAP database table in session variables. The reason is that when the users click on a label control, the onClick event will be triggered and I'll use these session variables there too. So after this code, on your flavor you will be able to see text coming from database table. The second for loop which is in if clause alters the visibility property of labels which are left unassigned values. Let's make it more clear, if you have 10 labels on the flavor, but only 8 URL is read from database table via RFC, the remaining 2 labels' visibility property is changed to hidden using .hide() method. That's all for the onLoad event of our sample flavor in this tutorial. Flavor editors will guess when a label is clicked, launchURL script is executed because we have already assigned onClick event to each label. 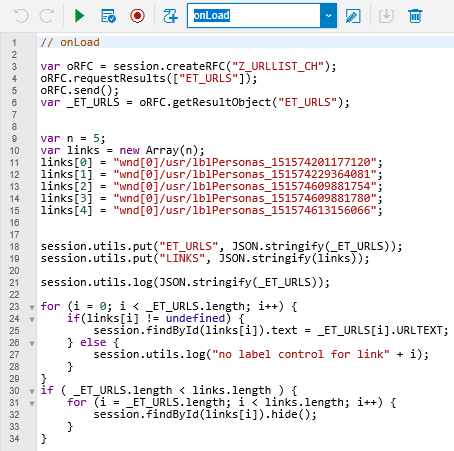 First, I read session variables using session.utils.get() method. Flavor editors might have the following question in mind. We have assigned the same launchURL event to all cloned label controls. So how we can distinguish which control is clicked on Personas flavor? How script editors can seperate which flavor control triggered the script event? In fact, source.id or source object is an input object which is not seen as a parameter in your script events but exists there by definition of SAP Screen Personas script events. When I query links array with the source.id I can get an index. And using this index I can get the target URL address from the URLs array. 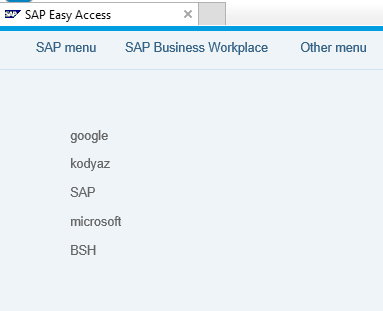 In this SAP Screen Personas tutorial, I wanted to demo how SAP Personas flavor editors and script editors can create links using label control and read target URL addresses from database tables using ABAP RFC function modules.